Sounds like some of the fishing we do here. What line you need depends on the water depth. If you are throwing flies into 6ft to 10ft of water then an Intermediate line like the RIO Coastal XP (like the current OBS but with a clear head) or the SA Sonar Sink Clear. If you are chucking flies into deeper water a fast sink head would be better. I really like the SA Sonar Sink 30 lines as the running line behaves and its smooth straight through into the head. I've tried the Orvis HD, Airflo Depth Charger and RIO OBS lines and the SA Sonar Sink is a much much nicer line IMO and has intermediate running line which i prefer. For flies a big chartreuse/white half/half gets down quickly and has a solid profile. A weighted black bunny works well too. No.1 rule of fly selection here is they have to see the fly in all that fizz and your fishing window is short. For leader don't go too strong as you will get hung up and you will have to pull for a break (in a hurry between swells!). So it's better to break the leader and lose a fly then ruin your fly line. Agreed neoprene liners work. But these boots do not have neoprene liners. It's just a neoprene strap around the top of the boot - maybe to keep the lacers from dangling down? How so as they don't keep sand/grit out of the boot? The do add a bit of support I guess but they are way above the ankle on the shin. Either way not sure I see the point, especially if you wear long socks. Just got a pair of Orvis Andros Flats Sneakers at a good discount. They are super light and comfortable but come up much higher than other boats, with a silly neoprene strap thing around the top that seems to serve no purpose if you are wearing them with socks folder down over the top. Seemed ok on mixed ground in Australia but not enough time for a proper review yet. It's mandatory reading for anyone visiting the cape Alan. Great work and thank you. Looks lovely. I'm seriously considering going to T&C next year. But I can't justify $1k for a guide so I will be DIYing the North and Middle islands with my expectations fully in check. 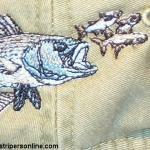 Are there any known tarpon/snook spots there I wouldn't mind some plan B options? Cam cleats for me. Small discrete and does not catch line. I'll be doing some bonefishing next month, all wading in the ever-present wind. So I suspect this will all be sub-40ft casts. Therefore I'm on the look out for a heavyish short head line that doesn't splash down too much. Any views? The Airflo Super Dri Bonefish is half the price of the RIO and SA Bonefish lines over here. Has any one used this? I'd definitely get the H3 - you could always flog it if you don't like it. Using polarizer or ND filters on iPhones? Wide or macro lenses? I've got the Sandmarc PLR filter. Whilst it definitely works with regards to cutting down surface glare, don't expect the same level as you would get from polarised fishing glasses. It is easy to use, simply clip it on and rotate the lens to alter the level of polarisation. But it is fiddly if you are in a hurry and it would be better if it came in a protective pouch. Inheritance Tax / Death Tax is still morally wrong regardless of how wealthy the person is. You are effectively being taxed on investments and assets that you have already paid taxes on. It forces bereaved relatives to sell the assets in order to pay the tax. I would also wager that most of the people getting caught out by this tax are the ones who are not super wealthy with tax advisors to set up funds but those who have been prudent with their money and have a house that has gone up in value to put them over the threshold. 40% tax on wealth you want to pass down to your family once you have gone is just wrong. If I need to carry more than what I can stuff down my waders and pockets I use a small cheap 15L roll top ruck sack. I don't like zips, even drysuit ones they use on those fancy Sims/patagonia packs. The ones I've tried are stiff and hard to close properly. I'm also too cheap to drop $$$ on a pack knowing the zip will give out at some point. Moulded stick on eyes. I should get some JC and try that. I tried and have since sold the SA Tropical Titan Clear Tip - same thing. Way too heavy if you had more than 30ft out. Dumped like throwing a brick in too. On a plus note the SA Sonar Sink 30 Clear 350gr casts great on my 10wt. I reckon these lines will be my go to for clear intermediates from now on. I've stopped putting eyes on my flatwings as I think the additional weight changes the action and sink rate of the fly. I now aim to keep them as light as possible as I think they swim better.